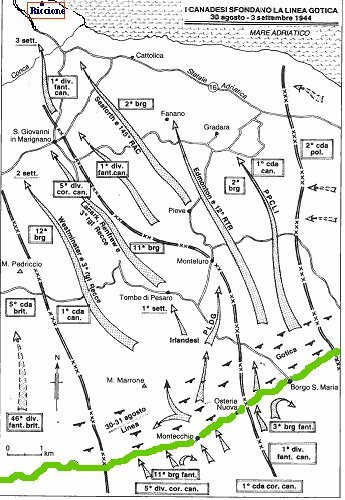 After the fall of Rome (June 4, 1944), the Germans retired to this new defensive line, a heavily fortified belt some 16 km deep, extending from south of La Spezia on the west coast, through the Apuan mountains and the Apennine passes, and then down the Foglia valley to the Adriatic Sea between Pesaro and Cattolica. 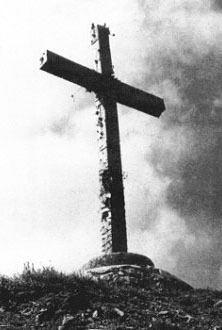 The offensive of the Gothic Line (Die Gotische Linie) of the autumn of 1944, although virtually ignored by the historians who have focused their attention on the "French invasions" of the summer (the D-Day in Normandy in June and the Operation Dragoon in August in southern France), was the biggest battle fought during the entire Italian campaign and it could be considered one of the crucial points of the entire war. It was launched at the urging of the British Prime Minister Winston Churchill with the aim of destroying the German Army in Italy and bring the Allies into the Balkans before the Red Army arrived there (a decision which led to "important divergences" between Churchill and Roosevelt). Its failure sealed the fate of the Balkans and of South eastern Europe. General John Harding, Alexander's Chief of Staff, proposed a straight, double Anglo-American attack across the Apennine passes between Florence and Bologna. This plan was rejected by the British commander of the 8th Army, General Oliver Leese, who did not want to fight alongside General Mark W. Clark, commander of the American 5th Army. In response, Leese proposed a different plan, denominated Operation Olive, which called for the Eighth Army to attack on the Adriatic coast to breach the Gothic Line and so force the Germans to move the bulk of their forces from Tuscany into the Romagna. At this point Clark was to have attacked the Gothic Line in the central part of the Apennines, now left undefended, and would have aimed for Bologna to attack from the rear the German Tenth Army fighting near Rimini, close the Germans in a pocket between the river Po and the sea and then sweep them off ! This plan was accepted by Clark who imposed, however, to extend his command to the British 13th Army Corps of General Sidney Kirkman (the 13th Army Corps was deployed on the Arno Line, between the 5th and the 8th Armies). (*) from August 30, 1944. The three Allied Corps were deployed to cover the entire front : the II Polish along the coast, the I Canadian on the Adriatica road, and the V British in the interland. In addition, Leese had the X British Corps of General McCreery along the high Tiber valley; this Corps, however, was only marginally involved in the operations. 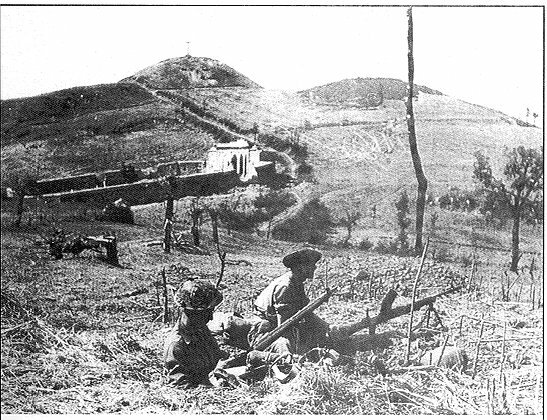 The attack against the Red Line (the Gothic Line outpost) started on the night of August 25, when the first infantry troopers (1st Canadian and 46th British divisions), supported by the fire of 1,502 guns and by more than 400 bombers, crossed the Metauro river. Germans were taken by surprise. The paratroopers of the 1st division, the "Green Devils of Montecassino", made a brave resistance but they couldn't stop the advance of the Allied forces. It was only on August 28 that Kesserling realized (the Germans had intercepted a piece of paper reporting a message addressed to the troops by Leese on the attack's eve) that what his High Command believed to be a mere skirmish was in fact THE main attack. He ordered the 26th Panzerdivision, the 29th Panzergrenadieren, and the 98th Infantry divisions to move immediately towards the Gothic Line (Green Line 1). These units, however, couldn't reach their positions before August 30. Between August 30 and September 3, the Canadians moved forwards their 1st Infantry and 5th Armoured divisions (see map beside), disrupted German defenses and reached, with a 15 miles jump, the Green Line 2 near Riccione where their hopes of reaching Rimini before the same day afternoon, were eventually halted by the German MGs of the 1st Parachute division, combined with the terrific fire of the 26th Panzerdivision's artilleries deployed on the Coriano ridge, up to the villages of Passano and San Savino. On the same days, on the left flank of the Canadian Corps, the powerful V British Army Corps (Gen. Keightley), who had been entrusted with the task of definitely knocking out the Germans, was instead facing serious problems in moving ahead, on the dusty and winding roads of the inland hill country, the three of his divisions (1st Armoured, 46th and 56th). 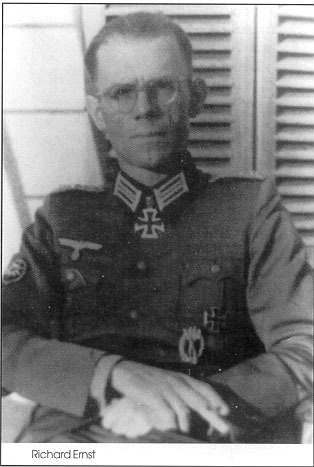 On September 3, General Fritz Wenzell, Chief of Staff of the 10th Arm�e, on his own responsibility and without informing either Kesserling or Von Vietinghoff (his direct superiors), gave order to the 100th Gebirgsj�ger Regiment of the 5th Alpine division to man the Gemmano hill and village and to the 71st regiment of the 29th Panzergrenadieren division to man the central point of the Coriano ridge, between the paratroopers and the 26th Panzerdivision. This decision (a real "fatal decision" for thousands of soldiers of the two armies and for hundreds of civilians) actually shut the door of the Lombard Plain down the Allies' face for more than three weeks and made of Gemmano the "Cassino of the Adriatic" ! Between September 3 and 4, the first Battle of Coriano began when the Canadians attacked Riccione (Royal Canadian Rgt) and Besanigo (Irish of Canada and Cape Breton Rgt, supported by the tanks of the 8th New Brunswick Hussars) while the British 1st Armoured Division, immediately after its arrival on the battlefront after a terrific march of more than 50 hours which had exhausted tanks and crews, was ordered to attack the Coriano ridge. Due to a number of tactical errors, inefficiencies and misunderstandings, however, the attack couldn't be launched before than sunset of September 4 by the Queen's Bays , 10th Hussars, and 9th Lancers tank battalions of the 2nd Armoured Brigade . 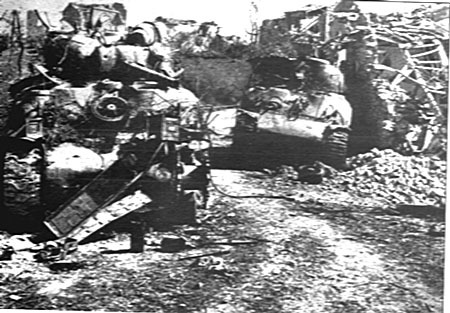 The terrific battle, focused on the frontline going from Coriano to Croce, exacted a heavy toll : at the end of the first day only 79 tanks, out of the 156 Shermans deployed (each batallion had 52 tanks), were still fit for battle. The fightings continued for two days, with gruesome losses for both the parties, on the entire front stretching from Riccione to San Savino until they ended in the evening of September 5. The first battle of Coriano had come to an end...and the Germans had scored a victory. .
During the night between September 4 and 5, the 56th Division (Gen. Whitfield) moved off toward Croce the 167th and 168th Brigades, supported by the tanks of the 7th Armoured Brigade. 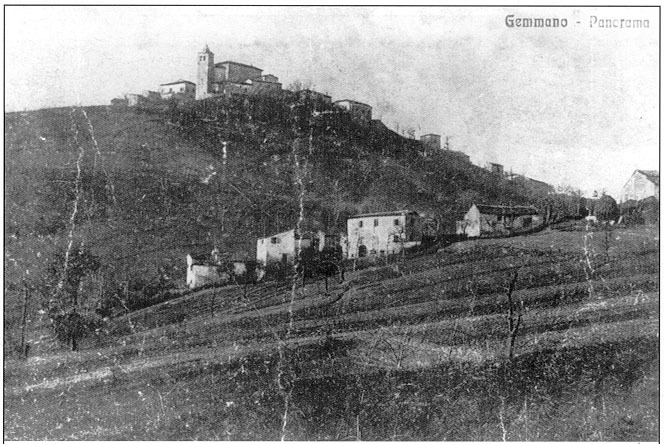 The sector was defended by 290th Regiment of the 98th Division, and by the fire of the guns of the 100th Gebirgsj�ger Regiment deployed on the hill of Gemmano. The battle lasted for five days; five days of bloody attacks and counterattacks carried out at short quarter house by house, door by door, which costed hundreds of casualties and the loss of dozens of armoured vehicles. The battle for Croce ended on September 9, when the 1st Welch took Ca'Menghino. When the first battle of Coriano was near to its end, Gen. Leese ordered the V Army Corps to advance along the river Conca valley and to take Montescudo (WNW of Croce) . Being the 46th Division bogged down on the hills around San Clemente, Gen. Keightley covered the front on the left flank of the 46th with the 56th Division (Gen. Whitfield). 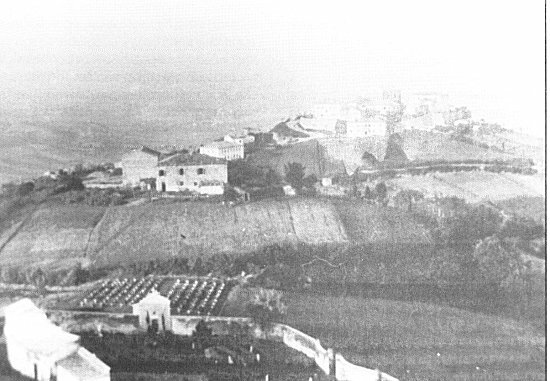 On September 4, the 167th Brigade of the 56th captured Montefiore Conca and one platoon was ordered to carry out a reconnaissance mission on the slopes of Gemmano . Late in the afternoon, however, Whitfield changed his mind, ordered to move off the bulk of the division directly toward Croce, leaving one battalion to dispose of the German defenses of Gemmano (which on Sept.4 suffered its first heavy bombardment by guns and aircraft). This decision, based on a gross understatement of the actual status of the enemy's defensive system, left the Germans free to hit with their artilleries the columns of tanks proceeding along the river Conca valley. 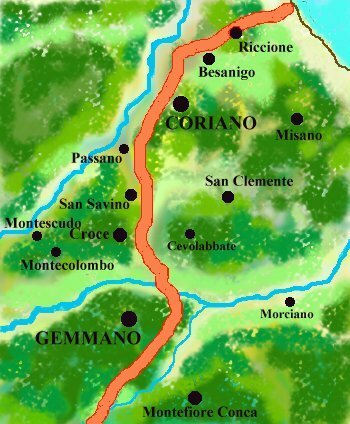 As said, the fortress of Gemmano was manned by the 100th Gebirgsj�ger Regiment, a unit which since the end of August was posted on the Galla Placidia Line, an anti-landing defensive line going from Rimini to Cesena. 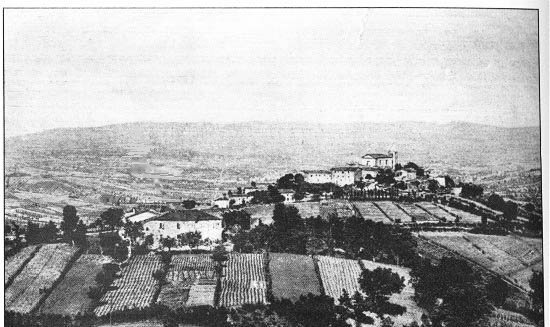 Lt Col. R. Ernst, CO of the 100th Regiment, had deployed his three infantry battalions astride of the hill of Gemmano, on a line going from Croce to Montefiore Conca : the village and its environments were defended by the II /100 battalion, on the left of the 2nd Bn, from Gemmano down to the Villa hamlet and further to the banks of the river Conca near Croce, there was the III /100 battalion. The I /100 was placed on the right of the 2nd Bn, and in particular on the top of the Farneto heights, along the Ventena stream and on the slopes of the hill of Montefiore Conca). In addition, Ernst relied upon the A.A.95th Recce Regiment and the 95th Artillery Regiment (Baron Le Fort). The force of the 100th Regiment was about 4.500 men, of which about 3.000 were fighting troops. 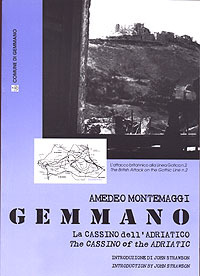 The Battle of Gemmano was one of the bitterest fightings of the entire Italian campaign. Four attacks were necessary to the British to sweep off the German positions and win the battle, which lasted more than ten days (from the afternoon of September 4 to September 15, when the hamlet of Zollara fell in the hands of the 2nd Camerons of the 46th Division) and exacted a tremendous toll of blood. According to British sources German deads were more than 900 (Lt.Col.Ernst estimated in more than 2.400 the casualties of dead, wounded, and MIA of his regiment). British casualties were immense too: every battalion (of the quite a few which took part to the assaults) lost, on average, from 100 to 150 men. More than 100 were the civilians dead. The daily chronicle of the battle, with details of the fighting units and images, are available in the other pages of this site. To give, however, a summary of the events, I deem appropriate to report herebelow a few excerpts of the book : "The Gothic Line (The Autumn Campaign in Italy)", by Douglas Orgill - London, Heinemann 1967 . "All around the the bullet-chipped cross on Pt.449, the dead, khaki and field-grey, lay heaped, unburied, in score upon score; at their centre a soldier of the Lincolns whose hands were still frozen in death round the cross itself, which he had reached in his battalion's first attack. Few regiments of 8th Army had ever known fierver fighting than that of Gemmano"
"Within twenty-four hours the only men left in the villages of Gemmano and Zollara and Borgo along the ridge were the men who would never leave". "They sat, wedged side by side, in the ruined cellars of the old stone houses; sprawled in piles on the doorways of barns; lay in untidy heaps in the little peasants' houses where they had crawled to die". "A good show. 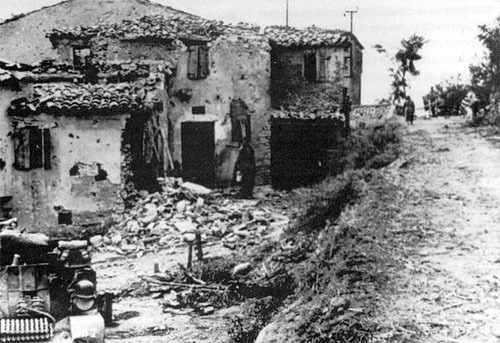 Gemmano full of dead and smells like another Cassino"
While blood was running on the Gemmano battlefields, Gen. Leese decided it was time for a decisive attack to Coriano (the first battle for Coriano had been won, on Sept.5, by the Germans). In a meeting with Keightley (5th British AC) and Burns (1st Canadian AC), it was decided that Coriano was the target for 5th Canadian Armoured Division (Hoffmeister) while San Clemente would have been taken by the 1st British Armoured Division (Hull). During the night of Sept.12-13, the New Brunswick Hussars, the Perths, the Cape Breton Highlanders, the Irish, the Westminsters, and the tanks of the Lord Strathcona's Horse, supported by a terrific storm of shells and bombs which actually paralyzed the opponents (in 24 hours more than 500 tons of bombs were dropped during the course of more than 700 missions), launched their final assault to the Coriano ridge. By Sept.14 the second battle for Coriano was over ... but this time victory was won by the Allied colors. On September 14 the remnants of the German forces, near to their definitive collapse, were assisted by the wheater which stopped the 1st British armoured division at the Fornacci stream. About ten days of heavy rains had made rivers and streams impossible to be crossed by the tanks. Moreover the 4th infantry division was halted by artillery fire on the Ripabianca ridge. 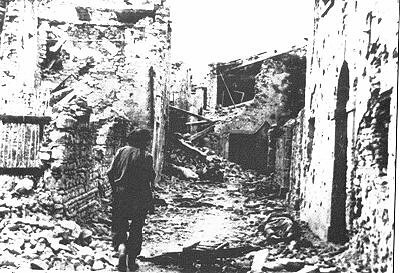 Finally, on September 21, the Canadian Corps, which included also the Greek Brigade and the New Zealkand Motor Battalion, conquered Rimini. Operation Olive was over !! 8th Army average daily casualties during the week of Sept. 14-21 : 145 dead and 600 wounded ! By September 25, out of the 92 battalions of the 10th Arm�e, only 10 had more than 400 men, 16 more than 300, 26 more than 200, and 38 had less than 200 men. Well, being interested in WWII history (with a special interest for the events occurred in Gemmano), I had always said to myself : "one of these days I will make a research on these facts" ... but nothing happened until, a couple of years ago, I met with Corrado Monti, another enthusiast of the Gothic Line (he has organized a museum of artifacts, arms, uniforms and other memories from the battlefields of "Operation Olive" ) who gave me some good hints and material useful to develop my project. Amongst the other, he provided me with a book written by Amedeo Montemaggi, an historian, President of the documentation centre referred to herebelow. This book ( a bilingual Italian-British edition) contains a vast, daily chronicle of all the battles, of other military events and personal experiences of the civilians refugees, occurred in Romagna during the first three weeks of September 1944. I have "visited" and widely exploited it to create this web site.